We’d love your help. 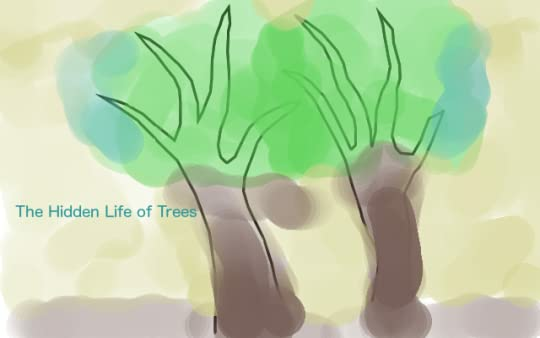 Let us know what’s wrong with this preview of The Hidden Life of Trees by Peter Wohlleben. In The Hidden Life of Trees, Peter Wohlleben shares his deep love of woods and forests and explains the amazing processes of life, death, and regeneration he has observed in the woodland and the amazing scientific processes behind the wonders of which we are blissfully unaware. Much like human families, tree parents live together with their children, communicate with them, In The Hidden Life of Trees, Peter Wohlleben shares his deep love of woods and forests and explains the amazing processes of life, death, and regeneration he has observed in the woodland and the amazing scientific processes behind the wonders of which we are blissfully unaware. Much like human families, tree parents live together with their children, communicate with them, and support them as they grow, sharing nutrients with those who are sick or struggling and creating an ecosystem that mitigates the impact of extremes of heat and cold for the whole group. As a result of such interactions, trees in a family or community are protected and can live to be very old. In contrast, solitary trees, like street kids, have a tough time of it and in most cases die much earlier than those in a group. To ask other readers questions about The Hidden Life of Trees, please sign up. Why does the author struggle to convey simple scientific information? Also, why does he struggle to get the information technically accurate? Also, why does the author not define his terminology? Also, why does he skim over points requiring scientific examples? Also, why does he lean on subjective ideas rather than using a decent PubMed search? Also, why are a number of his scientific comparisons incorrect? Diane Michael, interesting that on your profile, your only favorite quotation is R. K. Rowling's “If you want to know what a man's like, take a good look at…moreMichael, interesting that on your profile, your only favorite quotation is R. K. Rowling's “If you want to know what a man's like, take a good look at how he treats his inferiors, not his equals.” So did writing your snarky "questions" make you feel superior? Hmmm? 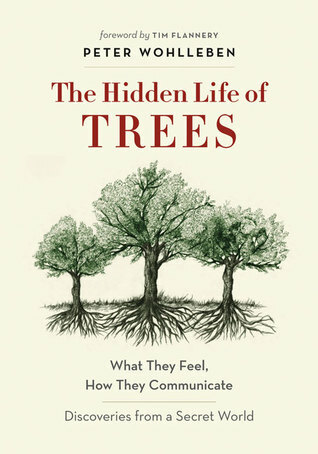 You may be a researcher, but my take is that this book's readers are not basic science "lab rats", but instead are a lay audience, who may have never before heard of or considered trees as social beings with senses and awareness and the ability to protect themselves against mobile foes who can cause them harm. I've heard this premise before and find it intriguing, which is why I picked it up to learn more about this fascinating topic. So what if it's anthropomorphic and charming in the telling? If he had gone the direction you suggest, it would not have had the appeal to his lay readers. I’m still reading the book, and am quite interested in continuing. Lighten up. Why does a book written by a German contain solely imperial units? Charles Translation for sure. In French, measures in this book are metric. 3.75★ If a tree falls in the forest there are other trees listening. 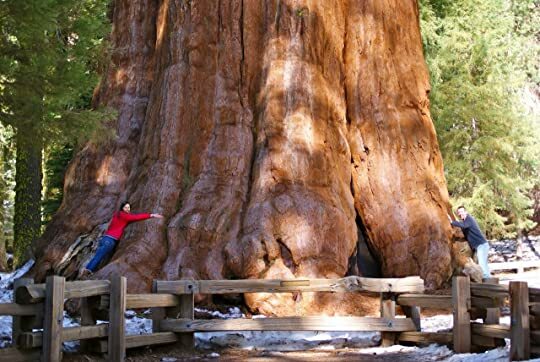 The first time I fell hard for a tree was in the Sequoia National Forest standing at the base of General Sherman. I was always a treehugger in my head but at that moment I was literally a treehugger. If you’ve never gazed up at one of the giants you are missing out on one of the earth’s wonders. [I don’t know these people but it was wiser to post their picture than mine because it’s not legal to step over that barrier and get so 3.75★ If a tree falls in the forest there are other trees listening. Back in the hippie days I knew people who talked to their plants, played classical music for them, and claimed there was a silent scream while trimming them back. Apparently these same compassionate people suffered no remorse when they smoked them, nor did I, but I digress so let’s move on. So I couldn’t resist reading this after watching a fascinating PBS program called What Plants Talk About. Who knew there really is a “wood wide web” in which trees, shrubs, and grasses exchange information. My hippie friends apparently did—it wasn’t the THC after all! I’m wondering if I should re-shelve Shel Silverstein’s book to the non-fiction section. I do recommend reading this book, even though I have given it only two stars! Remember two stars is a book that is OK! Read it for the new and interesting information it contains. The book reports up-to-date information about the complex, symbiotic networks underlying communication between trees. It stresses that trees should be seen not as separate entities but rather as parts of a community where individuals are aware of their neighbors, relate to them, communicate with them and help each othe I do recommend reading this book, even though I have given it only two stars! Remember two stars is a book that is OK! Read it for the new and interesting information it contains. The book reports up-to-date information about the complex, symbiotic networks underlying communication between trees. It stresses that trees should be seen not as separate entities but rather as parts of a community where individuals are aware of their neighbors, relate to them, communicate with them and help each other survive. Absorbing information about particular tree species, plants, fungi, insects and birds is provided. Anyone who appreciates nature, anyone who quite simply enjoys a walk in the woods, will find tidbits of interest. The writing all too often lacks clarity. Ecological and natural processes were not clearly explained. I would follow an argument and not understand why a particular conclusion was drawn. I would see other alternative explanations. One example is the discussion of the respective amounts of CO² stored by young respective old trees. We are told that plants of the same species living in the same soil and under the same conditions do not act in the same manner. An example is given of three oaks that dropped their leaves at different times. What we are told is that this was an “individual choice, a question of character.” Ah huh……..no more explanation than that?! Later in the book it is said that plants of the same species often have widely different genetic composition. (It is interesting to note that the variation is much more limited in animals.) Anyhow, this must be the explanation but this is just my guess. It should have been explained more clearly. Conclusions drawn should more often have been backed up with reference to particular scientific studies. The writing reeks of anthropomorphic expressions. This became extremely annoying. It made the entire content of the book feel childish. Yet this is not a book for children; previous knowledge of plant processes is a prerequisite. I will give some examples. Beech trees are referred to as Beech & Co., Spruce as Spruce & Co. Perhaps this is amusing once, but not ten times. “Ouch” is interspersed frequently - when discussing a lesion in bark, the loss of a tree limb, a hit by lightning or any damage done to a tree. The upper branches of trees are called “the executive offices”. “Foolish trees” are said to have not obeyed the “tree etiquette manual”. A volcanic eruption is “the shuffling of cards in the game of life.” We read sentences such as, “If we think back to tree kindergarten……” Maybe it is me, but this type of writing switches the book from being a scientific book of merit to a book of farce. This is a shame. Let me repeat, the book has valuable content. The content is poorly organized. Similar information is repeated in different chapters. The chapters are exceedingly short with ambiguous titles. Here are examples of titles: Let There Be Light, Street Kids, Burnout andDestination North. On completing a chapter you are left wondering what exactly had been the point of the chapter! What was its message? While there is definitely interesting information it is hard to absorb due to it being poorly organized. Beside the main themes, what miscellaneous information caught my attention? How woodpeckers make their homes in trees, working on several at the same time and in conjunction with fungi. The parasitic plant mistletoe can kill a tree, but moss and algae aren’t usually dangerous. It is normal that you don’t hear lots of birdsong in forests. The value of and conditions found in “old growth forests” were interesting, as well as how long it takes to establish such forests and how they differ from commercial forests. Leaving fallen trees is important - they make it harder for herbivore to consume undergrowth and they are home to a multitude of beneficial insects. This is just a smattering of assorted information. Each person reading the book will find different points of interest. I don’t regret reading the book, but its organization, and the author’s way of expressing himself could certainly have been improved. The audiobook narration by Mike Grady was clear and easy to follow. The German words are accurately pronounced. The author is a German forestry manager, writing on ecological themes. The book closes with a note by Susanne Simard. She is a forest ecologist. She has worked more than thirty years in the field and is currently doing scientific studies such as those discussed in the book. She is at the University of British Colombia in Canada. Her research confirms most of Wohlleben's observations about the communication among trees. As humans, daft creatures that we are, we are predisposed to look at where the action is. Swift movements, loud noises and bright colours capture our attention. Maybe this stems from our primitive instinct for survival, allowing us to spot the dangers darting in our general direction. Or it could be the result of our desire to procreate that can't make us look past flaunted flesh and luscious lips. Whatever the reasons, at some point we have begun to think in terms of foreground and background. As humans, daft creatures that we are, we are predisposed to look at where the action is. Swift movements, loud noises and bright colours capture our attention. Maybe this stems from our primitive instinct for survival, allowing us to spot the dangers darting in our general direction. Or it could be the result of our desire to procreate that can't make us look past flaunted flesh and luscious lips. Whatever the reasons, at some point we have begun to think in terms of foreground and background. The former is where the action is, the latter a necessary formality because the void would be too depressing an environment. During short lapses of my otherwise well-founded modesty I like to think of myself as something other than an utter idiot. In doing so I tend to refer to my habits of reading, writing, cogitating and looking at backgrounds. It's one of the ways to make scrolling through tedious travel pictures slightly more interesting. If a movie's dialogue doesn't ignite my interest, I find enjoyment in looking at the B-actors located in the background of the scene, pretending to go about their daily business, assuming they will remain unseen unless for when they'll point themselves out to friends and family. My smartphone camera comes with a focus that easily jumps in between the different layers of the hubbub I point it towards, making the scenery rich with potential for anecdote and diminishing the borders between foreground and background to a triviality. As someone who appreciates all that I allowed myself to think I was more than just a casual observer. A dreamy bubble that is now duly burst. One of the many things that Peter Wohlleben's book has taught me is that a lot of phenomena escape my flittering attention as I skip and skedaddle through life. The trees are such a phenomenon. A majestic backdrop to many of my sweetest memories, yet never given the notice they were due. Our world is full of magical places. These can be found on the ocean's vigorous waves, on a tranquil mountain top or in a lover's embrace. One other such place is under the canopy of trees. In their mystic shade of earthy green some people reach enlightenment, others find fundamental scientific truths and many discover peace. Troubled heads are cleared as they rest on ancient trunks and laden hearts are lightened by the sound of rustling leaves. Why are we not in constant awe for these beings of wonder that should be worthy of worship? "They come with fire. They come with axes. Gnawing, biting, breaking hacking burning. Destroyers and usurpers, curse them!" Wohlleben's book The Hidden Life of Trees worked the same way for me as the focus changer does for my camera. This book inaugurated a new sensibility that feels purposeful and asks to be deeply understood. The way I looked at the world and the way I looked at my memories had been tainted by a particular and exclusive interest for human affairs. Wohlleben put the splendour of trees in a sharp and welcome focus, opening my eyes as they welled up with remorseful tears. My perspective changed, and now an everyday city scenery has become a concrete concentration camp for trees forced to live in isolation, cut off from their potential and cut down to serve cityscaping needs. One redeeming factor is of course the knowledge that trees don't feel. How sweetly we sleep in the comfort of that intuition. Unfortunately, Wohlleben puts some question marks next to that soothing notion. This author's narration couldn't have been more convincing and captivating and the fact that I automatically read it with David Attenborough's voice in mind can serve to stress that point. The trees become both actors and center stage in this epic tale of survival against all odds. Their struggle for an inner balance as they grow, mend their wounds, spread their roots and branches, drop their leaves, drink the water and capture the sunlight makes for a truly engaging read. The race between a fungus eating its way to the heartwood and a tree growing healthy bark and moist material to stop the enemy in its tracks is more thrilling than a car chase, despite the impression that the timescale on which trees live make such matters less pressing. Yet they are pressing, and a matter of life and death. A tree can spend hundreds of years on its death bed but still serve a purpose, procreate and provide energy for its siblings and offspring. And when reading about this struggle for survival and growth, I could not help but discern a will for life that stirred within these entities. It's not just the trees that are the protagonists of this book, but also the tiny creatures that live on and around them. I've mentioned the fungi with which they have a love-hate relationship. Trees are also in what one might call a complicated relationship with small rodents, birds and insects, who sometimes help them in the dissemination of their seeds but can also wound them fatally. When caterpillars attack, reinforcements are called in with aromatic signals to deal with them. Ants are running their own brand of livestock farms as they herd aphids for the sugarry residues they leave behind when they feed off the leaves. The book is chock-full of such anecdotes that show us how trees are in fact megacities teeming with life. The biggest reveal came quite early in this book: trees communicate. As an introvert I didn't find that piece of information especially salient, but it does show that more goes on in the deep forests than a mere survival of the fittest. Trees often work together as a community, protecting and supporting each other, sending each other signals and goods. They use a "wood wide web" of roots and fungal chords that allow the transportation of nutrients from one tree to the other. They produce scents that get picked up by their cousins urging them to put up protective barriers before the enemy arrives. At the start of this book I had some severe difficulties accepting that the author would bestow certain qualities on trees that they couldn't possibly have, such as the capacity to feel, know, remember and be happy. Even after reading the book I have to admit this sometimes feels like a stretch, but that's really not the message one should remember from this review. The fact of the matter is that we don't know how far the sentience of these beings reaches. The latest scientific observations at least hint at the possibility that this author, which some might consider little more than a romantic treehugger, could be on to something. Even if trees don't feel like how we do, the realisation that trees are the hands that have been feeding us for many years should at least be a lesson in humility and inspire us to stop gnawing at them. Trees don't only provide us with the oxygen we breathe but serve many other vital purposes enumerated in this book, ranging from biodiversity to inland water supply. It's not just a matter of cutting down old trees and planting new ones, either. Balance is key, and such a balance can only occur on a timescale we can hardly grasp. If even 10% of this is true, we live in a mode diverse world than we ever imagined. Wood-wide-webs, allowing social interation between trees. Trees in friendship, feeding, hugging and warning each other. 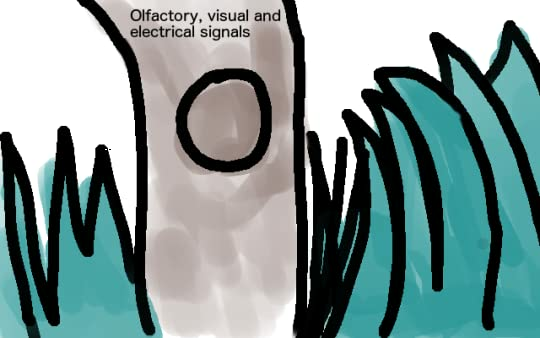 Trees having sense of taste and smell, talking to each other via sound waves of particular wavelengths. Tree lottery.... Forest etiquette... Only a true lover of all things natural could have come up with such poetic topics to discuss! Peter Wohlleben has written a beautiful book on trees. He captures the imagination and translates his vision well. Like many science books for the masses he takes a good deal of information and distills it well for the amateur forester and part-time tree-hugger. The only reason I give this book four stars and not five is because his biggest strength is also, perhaps, his biggest (or most important) weakness. I worry about the anthropomorphizing of animals, fungus, or plant. It is a strength because it creates empathy. It works. I read that a tree might feel pain, communicates, nutures its young, takes care of the sick, works together, counts, etc., and I am (hopefully, if I have any empathy in me) feel a bit more hesitant to abuse or misuse trees. BUT, my concern with this type of treatment is two fold: 1) trees aren't human. 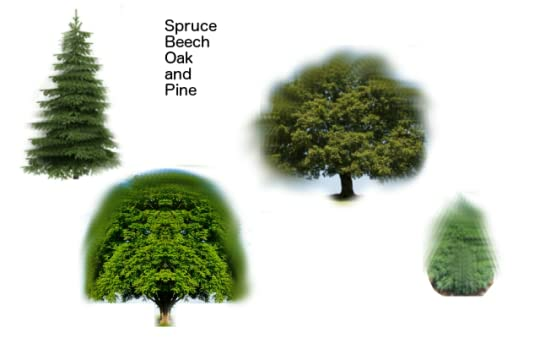 By focusing on the parts of trees (or forests) that appear to have human traits, we are putting ourselves at the center. We are creating (or strengthening the notion rather) that WE are the freaking center of the living universe. Those trees they are important because they LOOK/ACT like us. It is a slippery slope. Do the benefits outweigh the costs in the short or long term? I don't know. I just know there is a danger here. 2) perhaps, by giving these behaviors (communication, counting, etc) words that have a very significant meaning for man, we are actually NOT communicating what they are doing that is unique. Maybe communication or counting or nurturing ISN'T what they are doing and these human behavior metaphors are not allowing these amazing trees to be viewed as amazing AND alien enough. This isn't the same, but it for me is similar to comparing fungi to plants. Yes, their might be similarities, but these are two completely separate kingdoms. Sometimes, we can mix them together (in a salad perhaps), but some metaphors don't do justice to just how funky and beautiful and DIFFERENT these kingdoms really are. Perhaps, by making trees seem more human we are doing a long-term disservice by NOT making them seem alien enough. Darwin8u Usha wrote: "Like to borrow this book after our return from abroad." Absolutely. How goes your trip? Peter Wohlleben has written a wonderful little book about trees. He is a forester; he manages a forest in Germany. He must do a wonderful job, as he has amazing insights into the life of trees and tree society. Did I say society? Yes, trees communicate with each other, nurture their young, and aid the ill when disease or distress strikes. Does this sound unlikely? Well, it sounded a bit over-the-top to me, until I started reading this book. Forests are superorganisms that exchange nutrients throu Peter Wohlleben has written a wonderful little book about trees. He is a forester; he manages a forest in Germany. He must do a wonderful job, as he has amazing insights into the life of trees and tree society. Did I say society? Yes, trees communicate with each other, nurture their young, and aid the ill when disease or distress strikes. Does this sound unlikely? Well, it sounded a bit over-the-top to me, until I started reading this book. Forests are superorganisms that exchange nutrients through inter-connected root systems. They are a bit analogous to ant colonies. Wohlleben cites evidence of a 400 year-old beech tree that was actually being kept alive by neighboring beech trees! Acacia trees warn other nearby trees of giraffes who are feeding on them. As a result, the pre-warned trees pump toxic substances into their leaves within a period of a few minutes, causing the giraffes to leave the area. The giraffes walked 100 yards away, bypassing nearby trees before continuing to feed. They chewed on trees that were either oblivious to the warnings, or they walked upwind. These warnings are sent using electrical impulses that travel 1/3rd of an inch per second. These impulses are propagated along filaments of fungi. When trees sense insects eating their leaves, the trees can classify their saliva. Then they release pheromones that summon specific insect predators. So, it seems that trees actually have a sense of taste. I learned how older, mature trees nurture their young. Their enormous canopies shut out most of the light from the shorter trees, preventing the young ones from growing too fast. This enables the young trees to grow strong, dense wood that will eventually, in a hundred or two hundred years, to grow big and strong themselves. However, in forests that are overly managed, some of the bigger trees are culled, allowing the smaller trees to grow too fast. Then they never reach their potential height as they age. I learned why conifer trees grow needles and are "evergreen", while deciduous trees shed their leaves each fall. It would almost seem like conifers are "smart", as they do not waste energy growing new leaves each spring. But there is a reason for all this. Evergreens grow needles that are shed only once every few years. Each fall the needles develop a waxy covering that impedes evaporation over the winter. The needles have very little surface area for catching the wind and snow. Deciduous leaves, however, do catch the wind, and are a handicap during storms and snowfalls. They are dropped in the fall to prevent the trees from bending and breaking in a big wind-storm or under a heavy layer of snow. When evolution has figured out how to tell time and talk to one another, you wish the trees could also talk to us and tell their stories. Peter Wohlleben has come pretty close to speaking for them and I will never look at trees the same again. My father’s father was a legendary grafter of trees. So I was told. He died a few years before I sprouted so I never knew him. 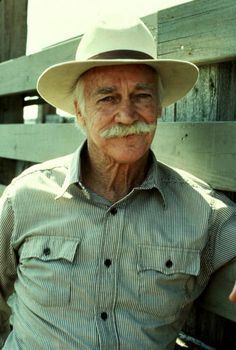 But my father, who had a sense of wonder at the way things worked, learned the art; and so, I was able to see a peach tree that had one branch full of plums; and he grafted a white dogwood to a pink one. No reason. Just to show he could. This technique, like many mechanical things, was not passed on to the next generation. Dr. Suzanne Si My father’s father was a legendary grafter of trees. So I was told. He died a few years before I sprouted so I never knew him. But my father, who had a sense of wonder at the way things worked, learned the art; and so, I was able to see a peach tree that had one branch full of plums; and he grafted a white dogwood to a pink one. No reason. Just to show he could. This technique, like many mechanical things, was not passed on to the next generation. Dr. Suzanne Simard, who helped discover the maternal instincts in trees, describes mother trees as dominant trees widely linked to other trees in the forest through their fungal-root connections. These trees pass their legacy on to the next generation and exert their influence in the upbringing of the youngsters. “My” small beech trees, which have by now been waiting for at least eighty years, are standing under the mother trees that are about two hundred years old – the equivalent of forty-year-olds in human terms. The stunted trees can probably expect another two hundred years of twiddling their thumbs before it is finally their turn. The wait time is, however, made bearable. Their mothers are in contact with them through their root systems, and they pass along sugar and other nutrients. You might even say they are nursing their babies. Eventually, the mimosa got sick and died. A life lesson. It was removed. It was then my father decided he would like to grow figs. Mimosas are tropical creeping herbs. They make particularly good research subjects, because it is easy to get them a bit riled up and they are easier to study in the laboratory than trees are. When they are touched, they close their feathery little leaves to protect themselves. Gagliano designed an experiment where individual drops of water fell on the plants’ foliage at regular intervals. At first, the anxious leaves closed immediately, but after a while, the little plants learned there was no danger of damage from the water droplets. After that, the leaves remained open despite the drops. Even more surprising for Gagliano was the fact that the mimosas could remember and apply their lesson weeks later, even without further tests. A marine chemist at the Hokkaido University discovered that leaves falling into streams and rivers leach acids into the ocean that stimulate the growth of plankton, the first and most important building block in the food chain. More fish because of the forest? The researcher encouraged the planting of more trees in coastal areas, which did, in fact, lead to higher yields for fisheries and oyster growers. Once upon a time, when I still worked, some no-goodnik lumber company decided to play fast and loose with the language in some ancient deeds and snuck onto a portion of the Allegheny National Forest – or as much as you can sneak while operating very large excavating machinery – and helped themselves to a heaping harvest of very tall, very old timber. It became my responsibility to see what could be done about that. This was very different from my usual assignments, and I’ve always liked different. The deeds went back to William Penn and were a twisted tale of courses and metes and bounds. As part of the investigation, I was invited into the forest. It was early May. The guy from the Department of Natural Resources said it was an active time for timber rattlesnakes so be sure to wear high boots. You know, having fun with city slickers. But, oh, my boots are well-traveled and the investigator who came with me was a seasoned hunter. There was one more person to complete our foursome: a forester. It is the forester that I want to talk about. Only with a beaten-up old ball cap from some feed company on his head. Kindly, yet not smiling, his face was worn and his eyes – HIS EYES – were sad, yet hopeful. Which is hard to do. He would not know how to lie. We trudged through the woods to where the loss and damage was. For you can’t remove large trees from the forest with heavy equipment without nicking other trees. The forester showed us the slashes to the trunks and then, explaining how the injury would eventually kill the tree, he circled the circumference with his arms. He was a different kind of tree hugger. The tour done, we repaired to a truck stop for lunch. Big-boy, buffet style. We piled our plates except for the forester, who took only a vegetable or two, citing a troublesome stomach, something chronic. The other two fellows were talkers, and they were trying to top each other with one wild anecdote after the other. The forester said nothing, but was looking at me, I guess trying to get my measure. The other two guys went back to the buffet, I thought maybe to set some kind of record. The forester and I continued to sit across the table from one another. He kept looking at me even though we didn’t speak. It dawned on me that he was from the forest and I was not. But surely there is a common ground. And after many minutes, his eyes never leaving mine, he swallowed, and said, “You full-leaf down there yet?” And I looked him square and replied, “Everything but the oaks.” And he paused, ever so slightly, and then gave me just the slightest hint of a nod. And it was as if I had passed some test, some test that meant more than all the tests academia and suits and skirts could ever devise. Translated from the German version, which was published in 2015, Wohlleben shares with the reader the “secrets” that foresters have known for a while. Trees live in, have, a relationship with the trees around them beyond the fact that they are trees in the same location. They retain memories that help them through the seasons (not to catalog the wrongs done to them), they have a sense of taste, smell, ‘hearing’ … just not exactly like we do. Many years ago, the first time I went to Maui, when I was in Lahaina I was fascinated with the Banyan trees, their interconnected root system, and their unique appearance. 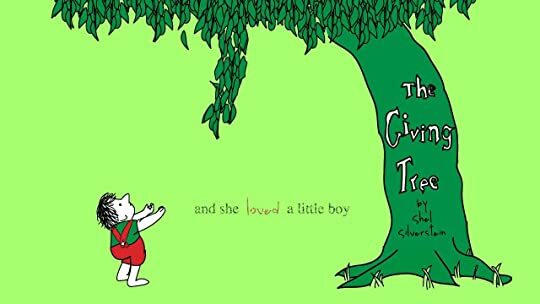 When I first heard about this book, I thought of those trees and I knew I wanted to read it. This isn’t overly heavy in the scientific aspect of trees, some sections flow with a lightness and ease that most people can easily relate to, and other sections get into a deeper peek, but overall this is a relatively undemanding read. If anything, it does require that you set aside everything you’ve ever believed about trees. The truth lies somewhere between chopping down a forest and believing that doesn’t hurt anything and that an aggravated apple tree can throw apples at you if you pick apples without politely asking, first. One would hope that would be true. Trees have memories, they have a sense of taste, and smell, they can feel, and through means other than eyes and ears, they can see and hear. There is a bit of humour in this, and knowledge to be gained - this is research-based information, but it’s also not a book about the science of the study of trees, it’s more along the lines of someone who is so enthusiastic about what he’s telling you that sometimes, every once in a while, he might digress a bit, and lose some readers for a few minutes. Overall, I found this to be fascinating, if not exactly everyone’s cup of tea. I kinda loved this. I learned a lot that is easily retainable, and know where to look for the answers. I loved the author’s gushingly boyish tree-crush-ing, but really, who can blame him for his enthusiasm? This was a charmingly enchanting read which benefitted by Wohlleben’s charisma and enthusiasm for the topic. Staring up at the blue and the blue stared back"
The house I grew up in had woods to one side as far as you could see, and woods behind as far as you could see. A few houses on our street, more streets in our neighborhood, with one lake and trees that surrounded the neighborhood. When I’ve been back there, it all pretty much looks the same. The tree that I climbed so high that I couldn’t get down by myself still stands there, the initials of almost every boy or girl carved into it with a + and another set of initials is now so high up on the tree I can’t see it. There are several absolutes I must have in my life: books, my family, my pets, and being surrounded by trees. I have learned over the years that for my mental health, I simply must have trees in my life. So when I heard about this book, I knew I needed to find out more. It was everything I could have hoped for. The author weaves a fascinating examination of the relationship between trees, insects, fungi, and the natural world of the forests. It's a beautiful, living, breathing community so much m There are several absolutes I must have in my life: books, my family, my pets, and being surrounded by trees. I have learned over the years that for my mental health, I simply must have trees in my life. So when I heard about this book, I knew I needed to find out more. It was everything I could have hoped for. The author weaves a fascinating examination of the relationship between trees, insects, fungi, and the natural world of the forests. It's a beautiful, living, breathing community so much more rich and complex than we have ever imagined. I was caught up in the magic from the first page. Barbara Great review, Jennifer. It is on my list. They are essential for my happiness, too. If you've ever pondered the thought experiment in which a tree falls in an empty forest and the sound of its fall is in limbo, Peter Wohlleben's nonfiction might be for you. Quite simply, the sound would be heard, according to Wohlleben, because trees are able to interpret sound and communicate with one another. Not only that, Wohlleben attributes memory and thought to the stationary beings which most of us have long considered non-sentient. This is a book full of revelations about trees and ask If you've ever pondered the thought experiment in which a tree falls in an empty forest and the sound of its fall is in limbo, Peter Wohlleben's nonfiction might be for you. Quite simply, the sound would be heard, according to Wohlleben, because trees are able to interpret sound and communicate with one another. Not only that, Wohlleben attributes memory and thought to the stationary beings which most of us have long considered non-sentient. This is a book full of revelations about trees and asks the reader (or in my case, listener) to reevaluate their understanding of the woody sentinels. The Hidden Life of Trees is a scientific book that attempts to broaden long held perception and enrich our interactions with forest. It is also a book that manages to talk about trees for much longer than you would have ever thought possible. Despite my score, this is a good book. It seems well researched, Wohlleben is obviously interested and excited about his field, and it brought to me knowledge I didn't have prior to listening to it. 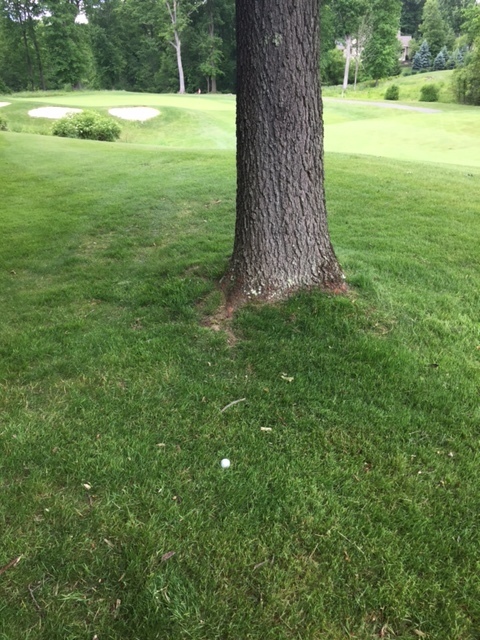 But...trees just aren't my thing. This brought me back to first year biology classes where a month or more was spent elucidating the inner workings of plants. It was one of those fields, of which there were many more to follow, that was nice to know about, but never piqued my interest like the fields of human physiology, biochemistry, and microbiology. So, even though I was pleased with some of the knowledge I took from this book, I can't say that I was really gripped by it. As I took another long commute, I found myself easily losing the thread of the narration when Wohlleben waxed lyrical about a particular species of tree. In short, I spent a lot of time bored with this book. When a novel fact was introduced to me, I thought, Hey, that's kind of neat, and then drifted back into relative boredom. But, there's a pretty good chance that another reader would really be into this one! I mean, just because I don't love learning about trees doesn't mean that you won't find a lot to like here. Certainly, when I take a walk in the woods later today I'll be thinking about how trees have a lot more going on than I would have thought a week ago. With that said, Wohlleben posits morale considerations for trees that I wasn't entirely able to buy by the end of the book. So: if you are really interested in learning more about trees, I'd say go for it! If you're more like me, then I'd probably pass on this one. Peter Wohlleben fotografia de Gordon Welters para "The New York Times"
Peter Wohlleben (n. 1964) é um guarda-florestal alemão que trabalha para o município de Hummel, na região de Eifel, sudoeste da Alemanha. Peter Wohlleben introduz ao longo do texto cinquenta e oito notas bibliográficas – que surgem referenciadas no final (mais de metade são em alemão o que no meu caso específico não servem absolutamente para nada - não as contei e sendo o escritor alemão! -); mas existem inúmeras referências e conceitos específicos florestais que obrigatoriamente deveriam ter notas de rodapé explicativas. Apenas alguns exemplos: o leitor comum não sabe o que é uma conífera ou uma caducifólia, o que são taninos tóxicos ou o que é a salicina, e muitos outros exemplos de que seria fastidioso continuar a referenciar. A questão da tradução de um livro “técnico” florestal suscita inúmeras interrogações. No caso específico de ”A Vida Secreta das Árvores” - o que o livro pretende e, que se comprova, com os mais de 350.000 exemplares vendidos é ser objecto de leitura e divulgação para o maior número de pessoas que têm fascínio pela natureza, que valorizam as árvores e as florestas, e que se preocupam com a preservação dos recursos florestais, incluindo, todos os seres vivos, vegetais e animais, que vivem em simbiose num dos mais dinâmicos ecossistemas terrestres – a tradução ou a edição portuguesa é francamente má. Concluindo, na minha perspectiva de leitor “florestal” ”A Vida Secreta das Árvores” foi um livro decepcionante. Adorei a temática: as Árvores são seres inteligentes; que sentem e comunicam entre si – através de uma “wood wide web”, o que nos conduz à descoberta de um mundo misterioso; mas não gostei da escrita/linguagem e, sobretudo, da abordagem ambígua sobre uma temática tão fascinante. No entanto, não posso deixar de recomendar a leitura de ”A Vida Secreta das Árvores” aos leitores “comuns” que sentem admiração e atracção pelas árvores e pelas florestas, porque, efectivamente, “acontecem coisas espantosas na floresta: árvores que comunicam entre si (enviando sinais elétricos através de uma rede subterrânea de fungos). (…) Árvores que têm sensibilidade, sentimentos e memórias.” - na contracapa da edição portuguesa. Agora vou ler: o livro de Stefano Mancuso Brilliant Green: The Surprising History and Science of Plant Intelligence e Bernd Heinrich The Trees in My Forest. I was inspired to read this book after reading The Overstory by Richard Powers, to learn more about the science of trees. Included are how trees communicate, migration patterns, how and why trees hibernate, their place in ecosystems and more. Wohlleben manages a forest in Germany and directly addresses some of the misinformation he learned in forestry classes. The tone of the book and its translation is very popular in tone, which made me question the science, but he does seem to cite a lot of li I was inspired to read this book after reading The Overstory by Richard Powers, to learn more about the science of trees. I am confused about this one. It started quite interestingly but gradually lost its joyous nature. After the 4th chapter it turned into a heavy, didactic plant biology/botany book. I felt like a freshman without enthusiasm, and decided to use the book as a reference. In the first three sections one can feel the writer`s enthusiasm for the trees. I liked the part `Final Road to Modernity` where he shares his view on the order in nature and the phylogenetic tree. He emphasizes how related we all a I am confused about this one. It started quite interestingly but gradually lost its joyous nature. After the 4th chapter it turned into a heavy, didactic plant biology/botany book. I felt like a freshman without enthusiasm, and decided to use the book as a reference. In the first three sections one can feel the writer`s enthusiasm for the trees. I liked the part `Final Road to Modernity` where he shares his view on the order in nature and the phylogenetic tree. He emphasizes how related we all are, coming from the same ancestor. As a young lad in Germany, Peter Wohlleben loved nature. He went to forestry school, and became a wood ranger. At this job, he was expected to produce as many high quality saw logs as possible, with maximum efficiency, by any means necessary. His tool kit included heavy machinery and pesticides. This was forest mining, an enterprise that ravaged the forest ecosystem and had no long-term future. He oversaw a plantation of trees lined up in straight rows, evenly spaced. It was a concentration camp As a young lad in Germany, Peter Wohlleben loved nature. He went to forestry school, and became a wood ranger. At this job, he was expected to produce as many high quality saw logs as possible, with maximum efficiency, by any means necessary. His tool kit included heavy machinery and pesticides. This was forest mining, an enterprise that ravaged the forest ecosystem and had no long-term future. He oversaw a plantation of trees lined up in straight rows, evenly spaced. It was a concentration camp for tree people. I was disappointed by this book, perhaps unfairly. 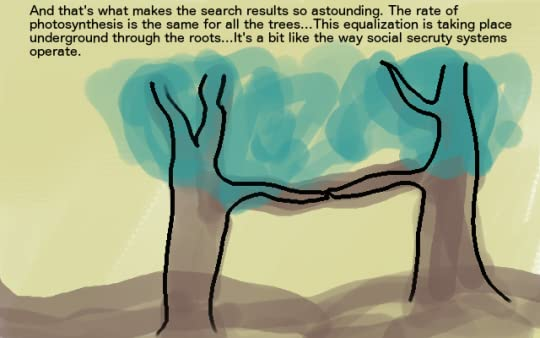 My main problem was with the language, and specifically the frequent use of slang, which detracted from what was supposed to be a readable but serious look at how trees in forests interact. I assume that this is down to the translator rather than the author, but would need to have that confirmed by someone who has read the German original. Words like "critters", "buddies" (referring to trees growing near one another) and "little guys" were inten I was disappointed by this book, perhaps unfairly. My main problem was with the language, and specifically the frequent use of slang, which detracted from what was supposed to be a readable but serious look at how trees in forests interact. I assume that this is down to the translator rather than the author, but would need to have that confirmed by someone who has read the German original. Words like "critters", "buddies" (referring to trees growing near one another) and "little guys" were intensely irritating. The worst of the lot came on page 216, where he was writing about ash dieback fungus, which had entered Europe from Asia and is destroying the ash trees in Europe. "Its fruiting bodies look harmless, even rather cute. They are just teeny-weeny mushrooms that grow on the stalks of fallen leaves." I wondered if each teeny-weeny mushroom had an itsy-bitsy elf sitting on it. Maybe the tree huggers are right. The communication network of plants and especially trees is highly sophisticated. Solitary or only annual growing plants do not approach the complexity of the papermaking base stock. Due to their root system and their size, trees are predestined for a key position. They communicate with each other via fragrances and warn each other of pests. This causes the Maybe the tree huggers are right. The communication network of plants and especially trees is highly sophisticated. Solitary or only annual growing plants do not approach the complexity of the papermaking base stock. Due to their root system and their size, trees are predestined for a key position. They communicate with each other via fragrances and warn each other of pests. This causes the warned to produce chemical substances for defense. If a human deforestation team is approaching, that is lost love effort. The interaction with the fungi, microorganisms, insects, and birds is a balanced system. Always a little bit in the balance between symbiosis, parasitism and the struggle for life and death. The shedding of the foliage or the constant needling promotes the formation of a favorite microflora in the soil for each plant. The wood wide web helps with communication. Forests are like multi-layered cities, in which, as in human metropolises above and below the earth, complex interwoven processes take place. Superorganisms in which the engine of evolution runs at full speed. Not everything is just sunshine for photosynthesis. It is also about disputing your competitors' living space. However, under the same species, there is the formation of communities of interest that balance the ecosystem. The monocultures of spruces, oil palms, tropical fruits, etc., have none of the positive characteristics such as biodiversity and suitable communication networks. There are more uniform deserts where only a few insects and animals can live. An ever-smaller gene pool of a few genetically engineered plants carries the risk of food crises when new pests emerge. Plants that fuse with state-building insects are taking a more extreme route of specialization. They make the ants dependent on their nectar and mix in a secret ingredient. This will make the ants biochemically unable to digest other similar foods. They become dependent on the tree and threaten to starve without him. In gratitude for this dubious symbiosis, the ants living in the tree defend it against any competitor as soon as they feel a shock or detect it other otherwise. There are still many variants of these symbioses and cooperations. However, you know. Rainforest deforestation. Both insect researchers and plant researchers have had bad luck and unfortunately are too late. Selfishness is no unknown factor in the tree kingdom. If eucalyptus or other trees require fires for reproduction, they promote them. They shed leaves all year round, leaving plenty of scales and allowing flammable gases to escape. Of course, it will also be beneficial to keep the annoying competition in this way in check as a side effect. Many trees with such a temperament are fireproofed as adults. They have to make their infants fire under the butts so they can get in the way. Suppose that it turns out in the future that all plants have feelings. A little pain reception. Alternatively, even emotions. They fear the chainsaw, the salad fork or the weedkiller. Fruits and vegetables would, therefore, be babies. Green and too soon picked fetuses. Then primarily the parent model of the plants is to be criticized. To pack your children in a tasty garnish, so that they are eaten, is pedagogically borderline. For the ethics of humans, it would raise the same dilemma as with meat consumption, vegetarianism, and veganism. In a way, it would be even worse, because the crops will continue to suffer, become weaker, and eventually be tortured to death with knives. Every time the vegetable compartment opens or someone goes to the fruit bowl, everyone screams in panic. When they start frowning and rotting, it is like slow starvation and gangrene for humans. What should people eat then? The last thing that would be missing then would be that all microorganisms turned out to be sentient. Then the last alternative for the production of food by biofermenter would also be ethically biased. People are unable to understand the language of the flora. They can not automatically conclude, they would not speak and feel too. Vielleicht haben die Baumumarmer doch recht. Das Kommunikationsnetzwerk von Pflanzen und insbesondere Bäumen ist hochkomplex. Solitäre oder nur jährlich wachsende Pflanzen kommen an die Diffizilität des Grundstoffs für die Papierherstellung nicht heran. Durch ihr Wurzelwerk und ihre Größe sind Bäume für eine Schlüsselstellung prädestiniert. Sie kommunizieren mittels Duftstoffen miteinander und warnen einander vor Schädlingen. Das veranlasst die Gewarnten, chemische Stoffe zur Abwehr zu produzieren. Wenn ein menschliches Rodungstrupp naht, ist das aber verlorene Liebesmüh. Die Interaktion mit den Pilzen, Mikroorganismen, Insekten und Vögeln ist ein ausbalanciertes System. Immer ein wenig in der Waagschale zwischen Symbiose, Parasitentum und Kampf auf Leben und Tod. Das Abwerfen des Blattwerks oder das stetige Nadeln fördern die Ausbildung einer für die jeweilige Pflanze günstigen Mikroflora im Boden. Das wood wide web hilft bei der Kommunikation. Wälder sind wie vielschichtige Städte, in denen wie in menschlichen Metropolen über und unter der Erde komplex miteinander verwobene Prozesse ablaufen. Superorganismen, in denen der Motor der Evolution auf Hochtouren läuft. Nicht alles ist eitel Sonnenschein für die Fotosynthese. Es geht auch darum, den Konkurrenten Lebensraum streitig zu machen. Aber unter derselben Art kommt es zur Bildung von Interessensgemeinschaft, die für eine Balance des Ökosystems sorgen. Die Monokulturen aus Fichten, Ölpalmen, Südfruchten, usw haben keine der positiven Eigenschaften wie Biodiversität und gute Kommunikationsnetzwerke mehr. Es sind mehr uniforme Wüsten, in denen nur wenige Insekten und Tiere leben können. Ein immer kleinerer Genpool mit wenigen, gentechnisch veränderten Pflanzen trägt das Risiko von Nahrungsmittelkrisen in sich, wenn neue Schädlinge auftauchen. Pflanzen, die mit Staaten bildenden Insekten fusionieren, gehen einen extremeren Weg der Spezialisierung. Sie machen die Ameisen von ihrem Nektar abhängig und mischen eine geheime Zutat hinein. Dadurch werden die Ameisen biochemisch unfähig gemacht, andere ähnliche Nahrung zu verdauen. Sie werden von dem Baum abhängig und drohen ohne ihn zu verhungern. Als Dank für diese zweifelhafte Symbiose verteidigen die im Baum lebenden Ameisen diesen gegen jeden Konkurrenten, sobald sie eine Erschütterung spüren. Es dürfte noch etliche Varianten dieser Symbiosen und Kooperationen geben. Aber sie wissen ja. Regenwaldabholzung. Da haben sowohl Insektenforscher als auch Pflanzenforscher Pech gehabt und sind leider zu spät dran. Egoismus ist auch im Baumreich kein unbekannter Faktor. Wenn für Eukalyptus oder andere Bäume Brände für die Fortpflanzung wichtig sind, fördern sie diese. Sie werfen das ganze Jahr Laub ab, damit viel Zunder vorhanden ist und lassen brennbare Gase entweichen. Sicher wird es auch günstig sein, auf diese Art zusätzlich als Nebeneffekt die lästige Konkurrenz im Zaum zu halten. Viele Bäume mit solch hitzigen Temperament sind selbst als Erwachsene feuerfest. Und den Babies muss man Feuer unter dem Hintern machen, damit sie in die Gänge kommen. Angenommen, es stellt sich in Zukunft heraus, dass alle Pflanzen Gefühle haben. Ein wenig Schmerzrezeption. Oder sogar Emotionen. Sie fürchten die Motorsäge, die Salatgabel oder das Unkrautvernichtungsmittel. Obst und Gemüse wären demnach Babies. Grün und zu früh gepflücktes fast noch Föten. Dann ist primär das Elternmodell der Pflanzen zu kritisieren. Die eigenen Kinder in eine wohlschmeckende Garnierung zu verpacken, damit sie gefressen werden, ist pädagogisch grenzwertig. Für die Ethik der Menschen würde es das gleiche Dilemma wie bei Fleischkonsum, Vegetarismus und Veganismus aufwerfen. Es wäre in gewisser Hinsicht noch schlimmer, weil die Pflanzen geerntet noch lange leiden, schwächer werden und schließlich mit Messern zu Tode gefoltert werden. Jedes Mal, wenn sich das Gemüsefach öffnet oder jemand zur Obstschale geht, schreien alle in Panik. Wenn sie verrunzeln und zu faulen beginnen, ist es wie langsames Verhungern und Wundbrand für Menschen. Was sollten die Menschen dann noch essen? Fehlte nur noch, dass sich auch alle Mikroorganismen als empfindungsfähig herausstellen würden. Dann wäre die letzte Alternative zur Herstellung von Nahrung mittels Biofermenter auch ethisch vorbelastet. This is an absolutely fascinating book. It shows a side to trees that will blow your mind (unless you're a smartypants and know it all already... but I'm pretty sure those people are in the minority). The only criticism I have of the book is that the author does go off on the pure speculation bus every now and then, leaving the hard science at the station. It wasn't a problem for me as I'm used to reading scientific works and am pretty good at separating the facts from the flights of fancy. Folks This is an absolutely fascinating book. It shows a side to trees that will blow your mind (unless you're a smartypants and know it all already... but I'm pretty sure those people are in the minority). The only criticism I have of the book is that the author does go off on the pure speculation bus every now and then, leaving the hard science at the station. It wasn't a problem for me as I'm used to reading scientific works and am pretty good at separating the facts from the flights of fancy. Folks who don't read much popular science might assume that everything the author says is fact and end up being slightly misled. I really, really wanted to like this book. Ever since I can remember I've felt at home in the woods, with trees exuding a reassuring aura of safety. Woods are calm, quiet, clement places for me. Yet despite this affiliation I know next to nothing about trees, so it was a delight to have this book recommended to me. Unfortunately that's roughly when the delight stopped. Perhaps I am the wrong person to review this book, as I've been used to scientific literature in entirely different - and more co I really, really wanted to like this book. Ever since I can remember I've felt at home in the woods, with trees exuding a reassuring aura of safety. Woods are calm, quiet, clement places for me. Yet despite this affiliation I know next to nothing about trees, so it was a delight to have this book recommended to me. Unfortunately that's roughly when the delight stopped. Perhaps I am the wrong person to review this book, as I've been used to scientific literature in entirely different - and more continuous - forms, but I found this book immensely frustrating to read. Wohlleben acts as an impish, endlessly curious guide to his forests (being a forester rather than an academic), and his genuine glee in discussing his charges is infectious. You get the sense that he attributes very real personalities to the species in his forests, and considers his interactions with the trees almost like interactions with colleagues or even friends. This much I very enjoyed a great deal. What was so frustrating that I abandoned the book before the end was the form his enthusiasm was communicated in. Wohlleben is like an old man in the pub, very eager to tell you about his particular area of interest, but does so in short anecdotes - little factoids that he thinks are cool. And they are! But they always leave you wanting more. Each chapter is frustratingly short, just developing a subject enough in a hand-wavy way before moving on to another. The book gives you intellectual whiplash with constant stops and starts. A must read! An absolute gem of a book. I might be biaised as I am what people would call a 'tree hugger'. I am sorry I did not come across this book earlier in my life. As someone who last studied ecosystems in the 80's as part of the 'normal' school curriculum, this was truly enlightening. I would recommend buying this book for all budding teenage scientists/biologists out there (and older ones of course). It is a very easy read and packed with invaluable information about our forests. The Hidden Life of Trees: What They Feel, How They Communicate . . . expresses Peter Wohlleben's own wonder and love for trees in well-researched, scientific and straightforward prose. 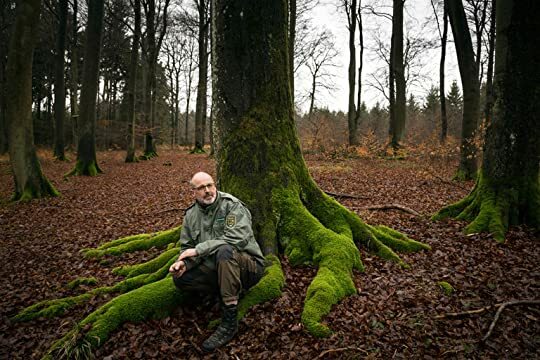 Wohlleben is a German forester who set about to educate people about trees - what they mean in our lives, how they affect us, how we affect them, and how they affect each other as families and communities of trees. Wohlleben's book is packed scientific research and his own observations of the forests that he manages. He reveals, for instance, that until the 1990s no one had ever researched or known that trees actually communicate with one another. 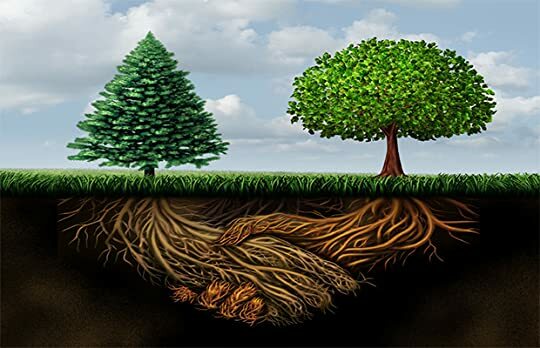 The phenomenon became known as the "Wood" Wide Web when it was discovered that trees in forests were connected by their roots and fungi systems through which they could communicate and feed one another. Through this underground connection trees look after each other and even care for and "feed" sick trees in their forest communities. Acacia trees in Africa were observed to use another method of communication to warn other acacias in the area of impending danger. When giraffes started munching on their foliage, the trees first pumped a bitter tasting substance into their own leaves and then released a scent or gas to warn other acacias of the approaching trouble. In old growth forests, trees' lives are measured, not in decades, but in centuries. A beech tree can live to be 400 years old. However, that single beech tree which produces "a total of about 1.8 million beechnuts" (p.29) in its lifetime will produce only one offspring that will become a full-grown tree - a one in an almost two million tree, a precious gem. You will never view trees the same way again after reading this book. Peter Wohlleben is a German conservationist and forester who manages a forest in the Eifel Mountains and has observed the slow-lane growth habits of his beloved trees, the secret underground social network that they share, the diseases and other dangers that threaten their survival--and most importantly, how crucial it is for the survival of all of us to allow forests to reach old-growth status again. I read this book as a com You will never view trees the same way again after reading this book. Peter Wohlleben is a German conservationist and forester who manages a forest in the Eifel Mountains and has observed the slow-lane growth habits of his beloved trees, the secret underground social network that they share, the diseases and other dangers that threaten their survival--and most importantly, how crucial it is for the survival of all of us to allow forests to reach old-growth status again. I read this book as a complement to Annie Proulx's new book Barkskins which is a work of historical fiction about the decimation of the beautiful old-growth forests in the New World. #2016-aty-reading challenge-week-50: a book originally written in a language other than English. This book was originally published in German in 2015 as Das geheime Leben der Baume and was translated to English by Jane Billinghurst. Ein sehr aufschlussreiches Sachbuch, dass selbst mir als Forstwirt noch viele neue Erkenntnisse geliefert hat. Lesenswert für jeden, da die Sprache nicht zwischen Fachbegriffen untergeht, zahlreiche "wow" Effekte. Do you want to learn about individualistic trees and community-minded trees? 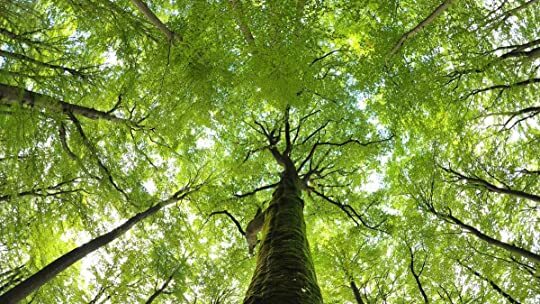 How different trees have evolved to communicate with each other and their environment and team up with their ecosystem to create a sustainable environment and protect themselves and others? Parental trees and teenager trees who, if their caretakers aren't around to facilitate their growth and educate them, grow too much too fast and, because they don't learn how to take care of themselves and live in moderation, die, in Do you want to learn about individualistic trees and community-minded trees? How different trees have evolved to communicate with each other and their environment and team up with their ecosystem to create a sustainable environment and protect themselves and others? Parental trees and teenager trees who, if their caretakers aren't around to facilitate their growth and educate them, grow too much too fast and, because they don't learn how to take care of themselves and live in moderation, die, in tree years, quite young. Wohlleben clearly has a great admiration and respect for trees and lovingly schools us about the dangers of cutting down the older trees in forests and clearcutting old growth forests with the mistaken notion that replanting a community of all young trees is good and fine and that these young trees are healthier than a multigenerational community of trees anyway. People in certain places seem to have similarly mistaken notions about human communities. I could offer a few other human analogies, but I'll leave it to your imagination. I listened to this book on audio and the narration was quite good. It was available through my library as a digital audio book. I'm trying to get in the habit of taking better notes when I'm reading, and especially while listening, I'm trying to start a tradition of drawing little comics as a way of taking notes and keep track of interesting moments and overarching themes. So, here are a few sketches doodled/notes taken while I listened to "The Hidden Life..." The third one is a direct quote from the text. The fourth one I don't quite remember what it was I was getting at. Though according to this article maybe it's just because they play starring roles in the book: "The narrative has a tiny cast of species — beech, oak, spruce, and fir. Elm, pine, willow, yew, and alders play minor supporting roles." Just a few pages into the Hidden Life of Trees by forester Peter Wohlleben, the first thing that strikes anyone who picked the book up believing it would be an antidote to that 'Human---All-too-human' feeling that one gets with having too many human motives and fantasies underpinning the stories one reads, is that it just ISN'T. Why? Apparently, there are arboreal denizens who talk to each other - both small talk and essential talk, make plans together - plans of procreation and family-building Just a few pages into the Hidden Life of Trees by forester Peter Wohlleben, the first thing that strikes anyone who picked the book up believing it would be an antidote to that 'Human---All-too-human' feeling that one gets with having too many human motives and fantasies underpinning the stories one reads, is that it just ISN'T. Why? Apparently, there are arboreal denizens who talk to each other - both small talk and essential talk, make plans together - plans of procreation and family-building included, strategize together against pests - ranging from minor warding-off strategies to full-fledged chemical warfare and intricately planned assassinations, offer favorable turf to members of the same tribe and hostile ones to those of another, nurse their babies and sick, steal and flaunt their wealth and what not. Anthropomorphizing nature thus, usually aggravates me by distorting and disfiguring the sights and smells along my usual escape-routes, and so I had a hard time reading some of the chapters, but have to say the book left a favorable impression on me nonetheless. After all, Peter Wohlleben uses this strategy with his story-telling chiefly to blur the boundary between humans and plants, which is key to some much needed empathy and an enhanced sense of understanding towards the arboreal world, which in turn keeps conservation well-informed and in the right direction. Without this picture, its hard to realize how exactly the commodification of trees and the seemingly benign alterations to old-growth forests cripples and wrecks trees, disrupts vital ecosystems, and makes our world sicker and poorer. Wohlleben brilliantly fuses his imagination, years of direct observation, deduction, and all the latest scientific findings about the inner workings of trees to give us a fresh, crisp narrative that is both spell-binding and paradigm-shifting, and which no doubt radically alters some long-held beliefs and throws in fresh moral conundrums. O início foi prometedor – o livro começa com a descrição de umas peculiares “pedras” cobertas de musgo, que se vêm a revelar ser afinal restos de cepos de árvores derrubadas há várias centenas de anos e que deveriam, segundo toda a lógica, ter há muito apodrecido e desaparecido em húmus no solo da floresta. A explicação reside num emaranhado de raízes subterrâneas que liga entre si árvores de uma mesma espécie e permite a troca de nutrientes entre elas. O autor continua a falar de árvores e de fl O início foi prometedor – o livro começa com a descrição de umas peculiares “pedras” cobertas de musgo, que se vêm a revelar ser afinal restos de cepos de árvores derrubadas há várias centenas de anos e que deveriam, segundo toda a lógica, ter há muito apodrecido e desaparecido em húmus no solo da floresta. A explicação reside num emaranhado de raízes subterrâneas que liga entre si árvores de uma mesma espécie e permite a troca de nutrientes entre elas. O autor continua a falar de árvores e de florestas, intercalando informação interessante como esta com outra menos interessante. O problema é quando dá largas à imaginação e começa a escrever sobre coisas como a amizade entre árvores, árvores com medo, árvores corajosas, etc. Fungos e animais também não escapam à antropomorfização, que aceito muito bem (e até gosto) em fábulas e livros de fantasia, mas me dá cabo dos nervos em livros técnicos ou de divulgação, como acho que este pretende ser. Penso que a ideia talvez seja chegar mais facilmente ao público, só que, na minha opinião, não só se corre o risco de transmitir ideias erradas, como se trata de um esforço perfeitamente desnecessário, porque a natureza já é, por si só, tão fascinante, que, francamente, não precisa destas “ajudas”! Posto isto, estive várias vezes a ponto de desistir do livro, mas lá fui persistindo, por um lado, porque ainda me custa deixar livros a meio, por outro, porque por entre escaravelhos desmotivados e fungos com espírito de conciliação, fui encontrando bastante informação interessante. Gostei especialmente dos capítulos que mostram o contraste entre uma floresta natural e pouco intervencionada, e uma plantação, os que explicam algumas das razões menos conhecidas de as florestas serem benéficas para a saúde humana, assim como do capítulo sobre as árvores das cidades, ou melhor dizendo, as pobres árvores das cidades... Relembrei o meu gosto de longa data pela flora e comprometi-me comigo própria (mais uma vez - é algo que faço todos os anos mas acabo por nunca cumprir...) a dedicar algum do meu tempo livre a este tema. “As florestas de coníferas reduzem consideravelmente a carga de germes na atmosfera, algo que os alérgicos conseguem sentir bastante bem. No entanto, a florestação trouxe também abetos e pinheiros para zonas onde não são de todo nativos, do ponto de vista da natureza. É aí que estas espécies migrantes começam a ter problemas. Em geral, são levados para regiões de menor altitude, secas e quentes demais para coníferas. Como consequência, o ar fica mais poeirento, algo que o leitor pode facilmente observar no verão, se olhar contra a radiante luz solar. E uma vez que abetos e pinheiros estão constantemente ameaçados pela sede, aparecem insetos para atacar essa presa fácil. Perante isso, começam a pairar mensagens odoríferas por entre as copas, em grande quantidade. São as árvores a gritar por socorro e a ativar todo o seu potencial químico de defesa. Tudo isto o caminheiro introduz nos seus pulmões em cada inspiração de ar silvestre. Será possível ao leitor detetar inconscientemente na floresta semelhante estado de alerta? As florestas em perigo são afinal de contas lugares instáveis, não constituindo um habitat adequado para o ser humano. E uma vez que os nossos antepassados da Idade da Pedra andavam sempre à procura de um lugar ideal para se estabelecerem, teria sentido se conseguíssemos compreender intuitivamente o estado do ambiente que nos rodeia. Isso é suportado pela verificação científica de que a pressão arterial de quem passeia pela floresta sobe debaixo de coníferas e, pelo contrário, baixa descontraidamente em zonas de carvalhos. Experimente você mesmo e veja em que tipo de floresta se sente particularmente bem”. 'The Hidden Life of Trees' is a bit like Dr. Spock's Baby and Child Care, only more Big Picture. The author presents a science of forestry for the general reader in an entirely new paradigm for understanding forests - anthropomorphically. Trees are people, only a lot less mobile and with the outlook of beings who can live up to 500 years old. Peter Wohlleben writes in a lively entertaining manner (as far as I know as my edition is translated from the original German to English). The author avoid 'The Hidden Life of Trees' is a bit like Dr. Spock's Baby and Child Care, only more Big Picture. The author presents a science of forestry for the general reader in an entirely new paradigm for understanding forests - anthropomorphically. Trees are people, only a lot less mobile and with the outlook of beings who can live up to 500 years old. Peter Wohlleben writes in a lively entertaining manner (as far as I know as my edition is translated from the original German to English). The author avoids scientific words but not the science of trees. He is not a scientist, actually, but in having studied forestry, he has been professionally responsible for managing forests for decades and he works with the intention of maintaining the health, and happiness, of his trees. Using his own observations and experiments, and in applying the recent discoveries of scientists, he thinks trees feel and act with more intention than we recognize. Given the evidence he presents in this book, Wohlleben convinced me trees act to improve their survival more than we know. Just like us, they are social beings, trusting most in their 'children', grown from their own seeds, and in nearby related tree members of their 'tribe'. Recently, evidence has been mounting trees also communicate with their 'family' primarily through symbiotic relationships with fungi parasites living on their roots, although different varieties of trees utilize other methods, too. Trees will support offspring or 'friends' - trees 'who' are sick or injured - with gifts of sugar and water, for example, through underground networks. There is a lot more information about the nature of trees, both as communities and as individuals, as well as how different animals and insects aid or distress them. The author also describes the effects of weather and water and time on the different tree varieties. Tree fill environment niches and compete with each other for sun and space, too. However, as usual, humans have dramatically interfered with their tree 'lives' both for better and worse - mostly worse, even when we are trying to be good stewards. The author uses a cute sentimental anthropomorphical vocabulary which might annoy some readers. I was startled by it, frankly, but it grew on me. The author feels affection for trees, but he does not think trees will hug him back. I think. For example, quoting from the book: "That means it is okay to use wood as long as trees are allowed to live in a way that is appropriate to their species. And that means that they should be allowed to fulfill their social needs, to grow in a true forest environment on undisturbed ground, and to pass their knowledge on to the next generation. And at least some of them should be allowed to grow old with dignity and finally die a natural death." This statement isn't as crazy as it seems; the author explains by examples and appropriate science how trees are healthier and live longer under conditions which appear to be physical analogs to arrangements which create human feelings of happiness. Wohlleben isn't claiming trees 'feel' happy, just that they appear stronger and healthier if they can 'arrange' their immediate environment without being touched or manipulated by humans. A forest can be built up naturally as a good place of strong and healthy tree, plant, insect and animal varieties - given 500 years or so of isolation. However, this is a timeline with which humans obviously have issues; we feel we need to clear the land for planting crops or human habitations or uses, or we try to save dying trees, or we accidentally or purposefully create a flora monoculture - because we don't understand that early tree pioneers and flora/fauna settlers of a new forest may need to later have a die-off. Other flora and fauna varieties establish themselves on top of the remains of the previous century's forest. This is normal. Forests undergo a process of maturing over time that results in an overall stronger forest which supports healthier flora and fauna. We mess up this process a lot, both through our destruction of old legacy forests and our lack of knowledge in caring for trees. 3.5 stars. Interesting stuff. I suspect I'd have gotten more out of this book if I'd read it instead of listening to it. Though I've always loved trees and found them calming, the author's detailed information about different aspects of trees has changed the way I look at them, and I'm unlikely to continue to take them for granted. “When trees grow together, nutrients and water can be optimally divided among them all so that each tree can grow into the best tree it can be. If you "help" individual trees by getting rid of their supposed competition, the remaining trees are bereft. They send messages out to their neighbors in vain, because nothing remains but stumps. Every tree now muddles along on its own, giving rise to great differences in productivity. Some individuals photosynthesize like mad until sugar positively bubbles along their trunk. As a result, they are fit and grow better, but they aren't particularly long-lived. This is because a tree can be only as strong as the forest that surrounds it. And there are now a lot of losers in the forest. Weaker members, who would once have been supported by the stronger ones, suddenly fall behind. Whether the reason for their decline is their location and lack of nutrients, a passing malaise, or genetic makeup, they now fall prey to insects and fungi.